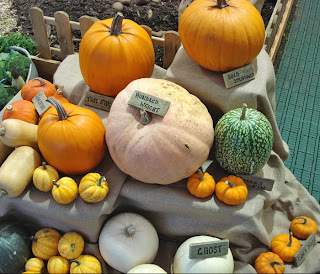 The Flour Loft: Apples and pumpkins..
We took part in an amazing event this weekend at RHS Wisley in Surrey. 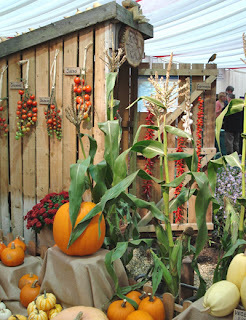 The event was a Taste of Autumn, which was a celebration of Autumn and local produce. 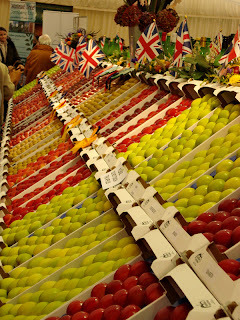 The event also included a display of competition fruit from the National Fruit show held last week in Kent. I've never seen so many different varieties of apples. Apple tasting and lots of local produce sampling was in full swing all throughout the weekend, even local WI groups were there serving homemade soup and preserves. The weather was glorious and visitor numbers exceeded all expectations. If you look carefully you can just make him out on the shed door. It was a great family event, with pumpkin carving and Autumn craft activities. 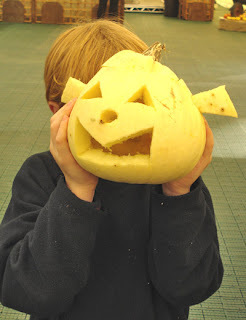 Here is a small friend with his fab 'Shrek' pumpkin! Our stall fitted in well with all our fruit, vegetable and flower designs. 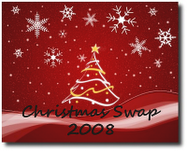 We met some lovely customers and made very good sales. We only have three of our shopper bags left in stock now! The RHS staff are fantastic and were all so helpful. After a week with a sick child, and a school craft fair on Thursday evening, i was extremely tired, but it was such a pleasure to be involved in and i really enjoyed the whole experience. The only sad thing was that we didn't get to meet alice c... we almost did.. but it wasn't to be. Maybe another time. 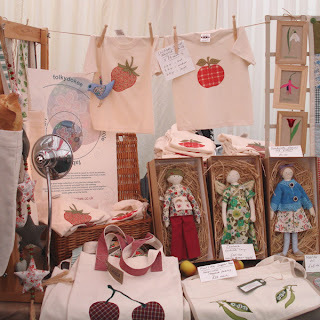 The t.shirts which we designed for Hampton Court with either a strawberry or apple on proved popular. We have apples left in all sizes and strawberries in the large only. small age 3-4, medium age 5-6 and large age 7-8. They are a transfer print from taken from our original appliques. They are £5 each .. please email if you would like to buy one. They are not on the website yet but i do hope to add them soon. This week is half term for us... We have already had a day out with Alice and the boys ending with seeing the film Ratatouille.. great fun. We are also hoping to create some more Autumnal pics and make our Hallowean costumes this week! I'll leave you with a picture my youngest did after collecting some leaves a few weeks ago... This is for Louise at thisismypatch. your stall looks beautiful. Well done! P.s. Will get in touch soon for a chat. I haven't forgotten. 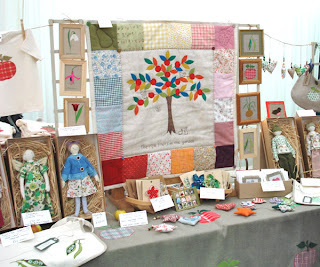 Your stall looks fab. Well done you for getting it all together. It sounds like a wonderful weekend. those apples look gorgeous. We're off to see Ratatouille this afternoon! Looked like a wonderful day. Your youngest is going to give Andy Goldsworth a run for his money! Your stall looked wonderful, as always. What a beautiful leaf picture your youngest is very talented and creative. 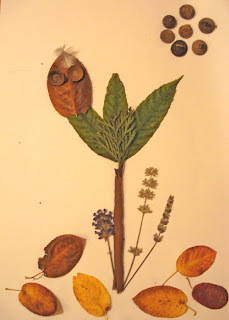 That leaf picture is truly beautiful - it reminds me of a renaissance manuscript. 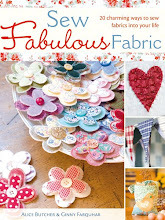 hello, i happened upon your blog via vintage pretty. 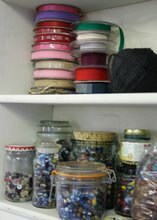 wow, what pretty things you make! 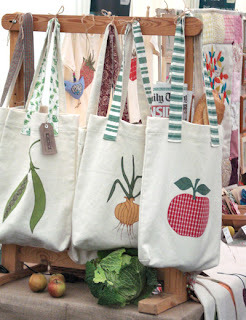 i love those shopper bags! and so many apples all in a row ...yum! Oh, that picture by your youngest is gorgeous and so clever! Your stall looked wonderful, and as you said, so in keeping with the theme of the whole thing. I've never seen apples so shiny! Your stall looks amazing, so many wonderful things. 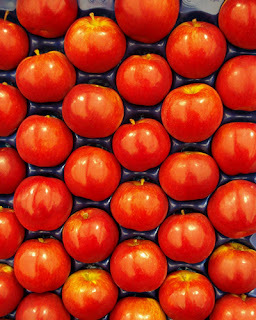 The apples look great arranged like that, a super display. That is the cutest picture! The little one is a little you! What a lovely post. 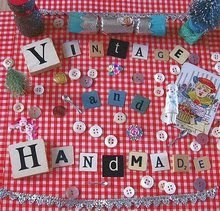 Your stall looks fantastic and I think that your creations are beautiful. 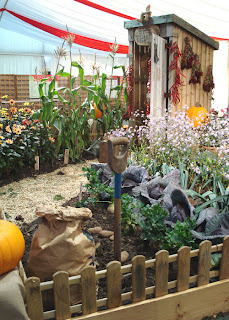 I love the pumpkin display and the story of the little robin and that picture with the owl and tree is quite charming. Oh I wish I lived nearer to Wisley! What a gorgeous display of autumn abundance! And you stall looks really cute to - well done!